One of the undoubted highlights of the Cambrian coast is the charming town of Harlech, famous for its imposing castle. The town a sloping hillside overlooking Tremadoc Bay across the sandy estuary from Portmeirion. Harlech Castle perches on a two hundred feet rock above the town of Harlech.The castle is a World Heritage inscribed site, founded by King Edward I in 1283, during his second campaign in North Wales, as one of an iron ring of fortresses to subdue the Welsh. 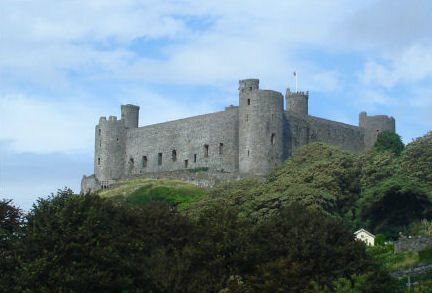 Designed by Edward's master architect, Master James of St. George, Harlech Castle cost £8,100 to build. Construction began in the spring of 1283 and was largely complete by 1289, at its height it occupied some 950 workmen. Situated high on a rocky outcrop, defended by sheer cliffs on one side, with a deep moat on the other sides, the castle is built in a concentric plan, with one line of defences enclosing another. All the exterior surfaces were originally rendered and whitened. The town's buildings are all of stone, mainly dating to the eighteenth and nineteenth centuries. It offers a range of amenities, craft shops, banks, a library, a chapel, hotels, guest houses and restaurants. The town is set amongst the impressive backdrop of the Rhinog mountain range, some of the most rugged and remote country in Wales. The nearby slate caverns of Chwarel Hen Llanfair were used for the film 'First Knight'. While Shell Island offers sandy beaches, rock pools, wildflowers and opportunities for birdwatching. The island derives its name from the variety of crustacean life washed up on its shores. *Commencing from the car park below Harlech Castle, turn right and follow the path leading through Harlech Golf Course which leads over the sand dunes to the beach. 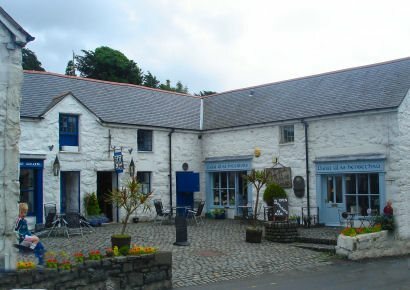 * On reaching the beach, bear right and continue to eventually arrive at the Glaslyn Estuary from where there are superb views of the Lleyn peninsula, Porthmadog and Borth y Gest. *Retrace your steps to return to the car park at Harlech.